The Sunday grind on partypoker covers all sorts of players and every level of buy-in imaginable, but the big boys and girls of the online High Roller stakes deserve a special mention this week – with the account rumoured to belong to Ole Schemion taking down the biggest tournament of the lot…. The $3150 buy-in Super Sunday High Roller saw SchelampigaUhu battling away at a fierce final table that included the Team partypoker duo of Anatoly NL_Profit Filatov and Joao joaosimaobh Simao, with $68,400 up top from the $240k total prizepool the 80 entries had produced. Two Canadians and two Brits made it to the ten paid spots, and the finale saw German highstakes crusher Schemion (if indeed it is he – the rumour mill isn’t always right!) downing Filatov heads-up for the win, the Russian taking $48k for second spot. Earlier in the day, the $200k guaranteed Sunday High Roller Grind saw a small overlay, 197 players ponying up the $1050 buy-in in what would be a marathon 11 hour affair – UK pro ADRIEN_BRODY setting his day up nicely with a $3560 cash that he would multiply 10x later that evening, as we saw above. Another trio of Brits would finish ahead of Brody, but it was Iveybluffallin who would eventually scoop the $40,780 top prize just before 3am CET, after seeing off Albania’s Genci rrinKS Kojdeheli heads-up. 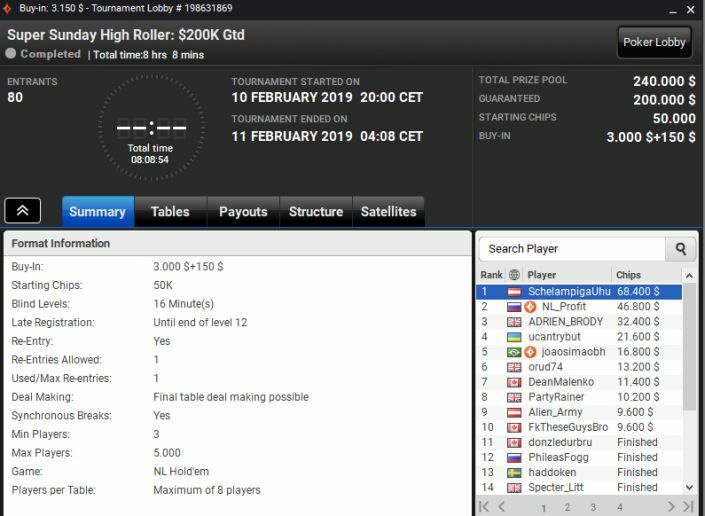 The early evening play on partypoker kicked off with the $530 buy-in version of the Sunday High Roller, and the Canadians were crushing the numbers game at the deep end of the tournament. Positions 9 down to 6 were all flying the Maple Leaf, although it was TheRepoMan86 in 4th spot who took Canadian bragging rights. No-one could match Russia’s Ilushan, however, who bagged another partypoker title and a healthy $20,390 bankroll boost. The $1050 Sunday High Roller pulled in 191 entries, another small overlay and free money in the pockets of those who made it through the always tough field, Albanian pro rrinKS adding $4k to his good day’s work. There was more than ten times that amount up top though, and it came down to a heads-up struggle between onehundredeyes and madgenius87, the latter finally seeing off his rival for a $44k+ payday. Last but certainly not least on a day full of action on the partypoker Sunday Majors grind, there was the $215 buy-in Sunday Main Event – drawing 534 entries that added almost $7000 to the $100k guarantee. Again we saw a host of Canadians deep in the money, but yet again a quartet falling 4 in a row like dominoes short of the ultimate prize. That honour went to Iqq1974 who prevailed over Mexico’s VTriggerKO123 to take down the $19,907 first prize after almost 10 hours of hard-fought poker.